To Cite: Moudi Z, Dehghani Chermahini E, Miri Moghaddam E, Navidian A. Motivational Interviewing and Compliance with Carriers Screening for Beta-Thalassemia Trait in Zahedan Premarital Counseling Center, Iran, Shiraz E-Med J. 2016 ; 17(10):e41381. doi: 10.17795/semj41381. Background: Screening and early genetic counseling programs for beta-thalassemia (BT) are of paramount importance during the pre-pregnancy period in high-risk individuals. Objectives: The current study aimed to evaluate the efficacy of motivational interviewing on couples` compliance with carriers screening for BT. Methods: The study was performed on 80 couples with suspected blood indexes for thalassemia trait (mean corpuscular volume (MCV) < 80 and/or mean corpuscular hemoglobin (MCH) < 27 and hemoglobin (Hb) A2 ≤ 3.5), referred to Zahedan premarital counseling center (PCC), Iran, from April 2015 to January 2016. The participants were randomly divided into motivational interviewing (MI) and routine care (control) groups; compliance was considered as number of couples referring to the center after 30 days post-intervention for re-evaluation of blood indexes, and in the second phase, if needed, referring to Zahedan prenatal diagnosis (PND) center for genetic testing, within five months. Results: In the first phase, noncompliance rates were 9.86% and 26.03% for the motivational interviewing (MI) and control groups, respectively. Preventive fraction (PF) indicated a 62% reduction in noncompliance after one month. In the second phase, five months after MI, noncompliance rates were 79.17% and 94.74% in the MI and control groups, respectively (PF=0.17). Conclusions: The MI group showed better compliance with short-term BT screening program, evidenced by higher rates of referral to the PCC. Thalassemia is the world’s most common inherited single-gene disorder (1, 2). Without preventive measures, it is estimated that annually around 60,000 infants are born with beta-thalassemia. In Iran, annually around 8,000 pregnant females are at high risk for BT (1). Children with beta-thalassemia major (BTM) require regular blood transfusion and iron chelation therapy. Therefore, a lifelong treatment, which involves a multidisciplinary healthcare team to monitor and manage complications, is necessary (3). However, in low- and middle-income countries, where patients receive inadequate treatment due to shortage of resources, inefficient health services and poor patient compliance, survival rates remain poor and the quality of life is severely compromised. Eventually, within the first five years of life, 80% of untreated infants die due to consequences of severe anemia (3-5). Thus, beta-thalassemia major treatment imposes a great emotional, psychological and economic burden on individuals, families and community members (3). A study in Sri Lanka revealed that just having adequate knowledge cannot prevent couples, who are both beta thalassemia trait (BTT), from getting married (6). Studies conducted in various countries indicated that early screening and genetic counseling programs are sensible and applicable (5, 7). Motivational interviewing (MI), as a person-centered, goal-oriented counseling method aims to change individuals’ perceptions on their unhealthy behaviors (8). MI with its nature (collaboration, evocation, and autonomy), principles (expressing empathy, developing discrepancy, rolling with resistance and supporting self-efficacy) and skills of motivational interviewing (open-ended questions, listening reflectively, summarizing, affirming and eliciting change talk) help resolve ambivalence, enhance motivation and promote behavioral changes (9-11). MI helps individuals identify their own values and goals and then reflect on their options to improve health (12, 13). The efficacy of MI, for instance in enhancement of breast-feeding behavior and compliance with drug consumption, was approved in ample studies (14, 15). In some studies (16, 17), the magnitude of behavioral change was reported 0.7. In Iran, the highest incidence rate of BTM was reported in the North, near the Caspian Sea, and the Southern provinces such as Sistan and Baluchistan. In these areas, 10% of the population has BTT (18, 19). In 2011, Sistan and Baluchistan province with 2050 BTM cases had the highest rate of thalassemia in the country. Accordingly, around 25% of new cases of thalassemia in Iran occur in this province (20). Former studies proposed that the high frequency of BT in Sistan and Baluchistan province is associated with high proportion of consanguineous marriages and growth rate (Moradi and Ghaderi; Rahimi). In addition, in an initial pilot study conducted in Zahedan city, in 2014, noncompliance rate was shown to be high, and out of 56 couples with BTT, only five (8.93%) couples referred to Zahedan prenatal diagnosis (PND) center for genetic testing. To the author’s best knowledge, there is a scarcity of published articles on MI for BT screening among couples with suspected blood indexes for thalassemia trait referred to Zahedan premarital counseling center (PCC). In Iran, thalassemia prevention program was launched in 1996. The program was initiated to identify carrier couples before marriage and suggest them to separate and marry a non-carrier person. Screening program is performed in six stages (Figure 1). Field studies demonstrated that many couples with BTT and at high risk or low risk for a BTM child insist on marriage and having children. These couples are referred to the PND center to determine the type of gene and its mutation type in couples, and sometimes, in some family members (19). Figure 1. 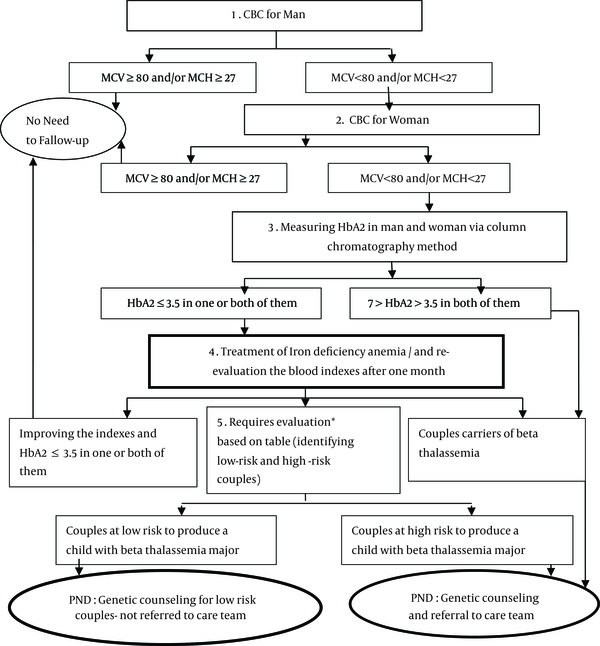 Guideline for the Laboratory Testing and Diagnosis of Thalassemia Carriers. * The blood indexes and further investigations, e g, Hb and Hct changes and Hb F; Adapted from: chronic disease program in Iran: thalassemia control program (19). The current study aimed to investigate the efficacy of MI on compliance with carriers screening for BT in Zahedan, Iran. This parallel, randomized control trail was conducted in the only PCC in Zahedan, Iran, from April 2015to January 2016. Zahedan is the center of Sistan and Baluchistan province, Iran, with a population of 669300 in 2013. In 2013, population growth rate and the total fertility rate for each females of reproductive age were 2.8% and 2.53%, respectively. Among couples referring to the PCC, with suspected blood indexes for thalassemia (mean corpuscular volume (MCV) < 80 and/or mean corpuscular hemoglobin (MCH) < 27 and hemoglobin (Hb) A2 ≤ 3/5), 80 couples were randomly assigned into two groups (Figure 2). The inclusion criteria were: 1) No history of mental illnesses (based on history of medication use or inpatient care in a mental hospital), 2) First marriage, and 3) Females aged < 45. The exclusion criteria were: 1) Being pregnant at the time of referral to the center, 2) Illiteracy, 3) Failure to attend the counseling sessions, and 4) Lack of willingness to participate. At first, the pilot study carried out on the couples receiving the routine care revealed that only 11.36% of the couples who required genetic screening referred to the PND center. With a type-І error 0.05, power (1-β) of 80%, and a 30% difference between the two groups, the standard sample size for each group was calculated 35 ~ 40 (21). The eligible couples who volunteered to participate in the study were randomized into one of the two groups of routine care and routine care plus motivational interviewing (MI). The couples were allocated into two equal groups (n = 40 couples in each group) using randomized block design. In this study, the block size of four was employed. When the block size was determined, all the possible balanced combinations of assignment within the block were calculated. Afterwards, four numbers were assigned to each block. Blocks were randomly selected using random number table by a faculty member other than the authors to assign the couples to the groups (22). Consequently, the numbers of participants were placed in opaque envelopes by a person who was not involved in the study design, intervention and evaluation. After opening the envelope, couples in MI group were given verbal information about the objective of the study, time of sessions and the study procedure. Subsequently, written informed consent was obtained from the MI group. The control group only received the routine care. Due to nature of the study, neither participants nor scholar could be blinded to the intervention. But, participants were blinded to the study hypothesis. All blood tests were performed in a laboratory outside the PCC. Laboratory clinicians were blinded by not informing them of group allocation. Outcome assessors blinding was also done using an independent individual unaware of group allocation. Some participants were from nearby villages and had to travel a long distance to PCC; nearly all of them were busy preparing for their wedding. Of course it was not mandatory for couples to participate in the several consultation sensations. Consequently, couples mostly refused to participate in several sessions. Therefore, due to time constrains and legal and ethical issues, the MI sessions had to be limited to three 90-minute sessions (within two days). MI was conducted at the PCC in a private room with the presence of only one couple and interviewer. The interviewer was a postgraduate consultant student, trained on MI skills. When the MI group received the routine consultation, the MI group received three educational counseling sessions based on motivational interviewing. Structure and content of each educational session are demonstrated in Table 1. All efforts were made to help couples through the change process by eliciting self-motivational statements (23). At the end of each session, the couples were asked “Are there any questions?” Additionally, at the end of all the sessions, a summary was provided to elicit and reinforce change and aid couples progress, and the couples were inquired “What do you think you will do now (21). What’s more, the confidence ruler (22) was employed to question “How confident are you that you can do it? (Comply with BT screening instructions)”. 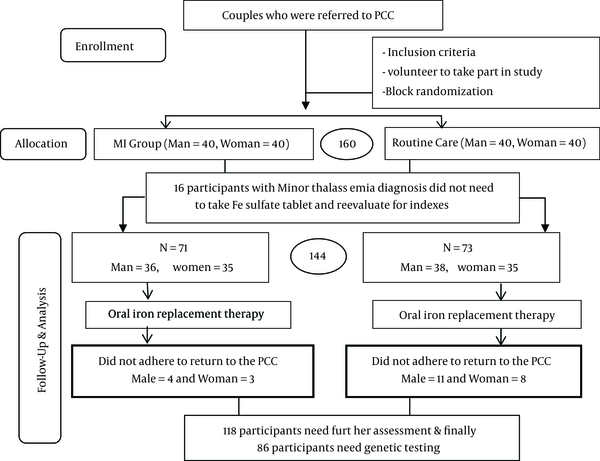 For the MI and routine care groups, the outcomes were evaluated within two phases; first, one month’s post-intervention (the number of participants attending the PCC to re-evaluate red blood cell indices, and if needed, other laboratory testing), and second, five months later (the number of participants who attended the PND center for genetic testing). Data were analyzed using SPSS version 16. The study employed two-tailed tests to compare the variables between MI and control groups. Normality of continuous variables was tested using Shapiro-Wilk test. Data (age) without a normal distribution were analyzed performing Mann-Whitney U test. Additionally, Chi-square and the Fisher exact tests were run to analyze categorical and binary data. Kirwood and Sterne noted that when the numbers in the 2 × 2 table are very small, the Fisher exact test should be used (24); and when the numbers in the 2 × 3 table are very small, the Monte Carlo test is used. Finally, relative risk (25) and preventive fraction (PF) were calculated to show the percentages of non-compliance that can be prevented if couples take part in the MI sessions, compared to those who do not receive MI. The current study was carried out after receiving approval of the Ethics Committee of Zahedan University of Medical Sciences ir.zaums.rec.1394.108- 2015 and registered in IRCT 2015061022651N1-1st Aug 2015. Figure 2 demonstrates the flow of participants. Of the 160 females and males (40 couples in each group) participating in the study, 16 participants were diagnosed with BTT. These participants were only excluded from iron supplementation program, but were included in the counseling program and tested to determine the carrier status of their couples. In the MI group, all the participants (80 males and females) took part in the three MI sessions. The mean ages of the control and MI groups were 22.58 ± 5.39 years (age range: 14 - 39 years) and 22.30 ± 5.06 years (age range: 14 - 37 years), respectively. The results of Mann-Whitney U test for the age of the participants in the MI and control groups showed no statistically significant differences (Z = 0.091; P = 0.9). The remaining demographic characteristics of the two groups are exhibited in Table 2.
bBecause four cells were expected count less than five and it was not possible to integrate cells, the Monte Carlo test was used. Regarding attendance of follow-up, 9.86% participants from the MI group and 26.03% participants from the routine care group did not attend the first follow-up in the first post-intervention month (Table 3). The most common reasons not for refer to the PCC among participants in the MI group were: geographical distance with the PCC (living in rural areas), out of town (because of job, or being a soldier) and the worry that they were forced to cancel their wedding. The benefit of MI was only evident in referring to the PCC to re-evaluate red blood cell (RBC) indexes, and if needed, other laboratory testing to discriminate between iron deficiency anemia, beta-thalassemia trait and other haemoglobinopathies. Consequently, the RR=0.38 reflected a positive association, and PF indicated a 62% reduction in non-attendance in the first follow-up in the MI group. A total of 86 participants were categorized at low- or high-risk of having children with BTM, and needed to refer to the PND center for genetic testing. At five months, there was not statistically significant difference in referring to the PND center between the MI and control groups. Moreover, the data showed that MI prevented only 17% of the noncompliance cases after five months (Table 3). Abbreviations: PCC, premarital counseling center; PND, prenatal diagnosis; MI, motivational interviewing. bBased on the blood indexes and further investigations, couples were categorized into: no need to fallow up (14 in the routine care and 16 in the MI group), other haemoglobinopathies (two in the routine care group), and inconclusive (38 in the routine care and 48 in the MI group). Couples in the third group were referred to the PND center for genetic testing. Within five months, 12 eligible couples who replied the phone call were asked about their reasons for not referring to the PND center for genetic testing. The factors influencing referral for genetic testing in order of importance were: lack of health insurance coverage (seven couples), lack of time (four couples), need for parental consent (one couple), divorce (one couple), and not a top priority as one couple stated, genetic testing should be performed before pregnancy. The trial was designed to examine the efficacy of MI in encouraging couples to refer to the PCC for reevaluation of blood indexes and, if needed, to the PND center for genetic testing. The first phase of the study was consistent with the objective of MI (evokes self-motivation), and increased self-referral to the PCC for reevaluation of blood indexes one month post-intervention. Previous studies proposed that the rate of short-term therapeutic compliance was about 70%-80% for different patient populations and diseases. While, the lowest rate of compliance (20% - 30%) was associated with lifestyle changes (26, 27). The current study results showed that the rate of short-term compliance with the first phase of BT screening program was 90.14%, although it was necessary for high-risk couples to return to the PCC after one month (of initiating iron supplementation) for re-evaluation of blood indexes and differential diagnosis of thalassemia and iron deficiency. In fact, the couples who did not return to the PCC were not able to obtain the necessary certification to register their marriage officially. Therefore, a part of the observed compliance in the first phase might be associated with this issue. Ryan noted that external regulation is a short-term approach to change (and sustaining positive behaviors), which underscores the role of motivation (28). The preventive fraction showed that despite the external regulation and force applied to the two groups, for blood screening tests, MI could significantly lower the rate of non-compliance 0.62% with BT screening tests. Studies suggested that efficacy of MI might be due to its collaborative nature rather than the one-way flow of information and that the counselor’s skill of empathic understanding can provide a safe atmosphere that paves the way for acceptance and positive changes (29). Thus, MI is a directive method to enhance intrinsic motivation and instigating change in a predetermined direction while working with patients/clients who are ambivalent or in the pre-contemplation stage (28, 30, 31). In the second phase, the outcomes manifested a compliance rate of 20.83% (PF= 17%) in eligible couples who had to refer to the PND center for genetic screening tests, at five months follow-up. This rate was very low in comparison with the first phase, but compared to the pilot study (8.93% in 2014) and control group (5.26%) was about 2.3 and four times higher, respectively. The reduced compliance rate can occur for a variety of reasons. First, the genetic screening tests for BT screening program (after blood screening tests to register marriage officially) is not mandatory; which can partly explain the role of the external regulation and force on compliance with blood screening tests. Second, the couples categorized as low-risk were told that the risk of having a baby with BTM was very low and genetic testing was not mandatory. Schneider proposed that not having a health care provider’s recommendation is the most important predictor of not performing genetic testing (32). In the present study, no one in the low-risk group referred for genetic testing to the PND. According to Ryan, an individual may lose his/her motivation when he/she does not benefit from change or simply does not deem it as important (28). Finally, in accordance with the current study findings regarding the high-risk group, Backes argued that even with selective referral, patient compliance was still a major problem and indicated that only 28% of all eligible patients referred to a genetic counselor (33). According to Elwyn, while MI is most useful in situations that commonly require behavior change to improve health outcomes, other methods (e g, shared decision making) help couples to make decisions where there is more than one option to choose (25). As a result, in the present study, the elements of both MI (in phase 1) and shared decision making (in phase 2) may be necessary to obtain better results in the second phase. There were a number of limitations to the present study. First, considering ethical (consent permission) issues and sense of threat, authors were not able to address fidelity. Second, in the first phase, authors were not able to measure the net effect of MI (without the role of mandating) on referring to the PCC, although it was applied to both groups. Third, limited sample size and lack of qualitative data that could help with understanding couples’ real reasons for noncompliance and not referral to the PND center for genetic testing. Despite these limitations, the present study, as the first study on this issue showed that MI may promote efficacy of compliance with BT screening program in the short-term interventions. In summary, MI with its goal-oriented nature and directive method seems to be efficient in increasing short-term compliance with BT screening program. The current study results showed that self-motivation and mandatory rules affect compliance with the BT screening program. Thus, to increase long-term compliance with this program, it is necessary to conduct a qualitative study to identify factors contributing to non-compliance. Also, the elements of shared decision making may be necessary to obtain better results in the second phase. Authors would like to thank the staff of the premarital counseling center for their kind cooperation with this study. Authors also express their gratitude to the couples who participate in the study. Authors’ Contribution: All authors participate in study design, concepts and revising of the manuscript; Esmate Dehghan and Zahra: selecting participants, acquisition of data, statistical analysis and interpretation of data; Zahra Moudi: preparation of the manuscript. Funding/Support: The current study was financially supported (N.7370) by the deputy of research and technology, Zahedan University of Medical Sciences, Zahedan, Iran.